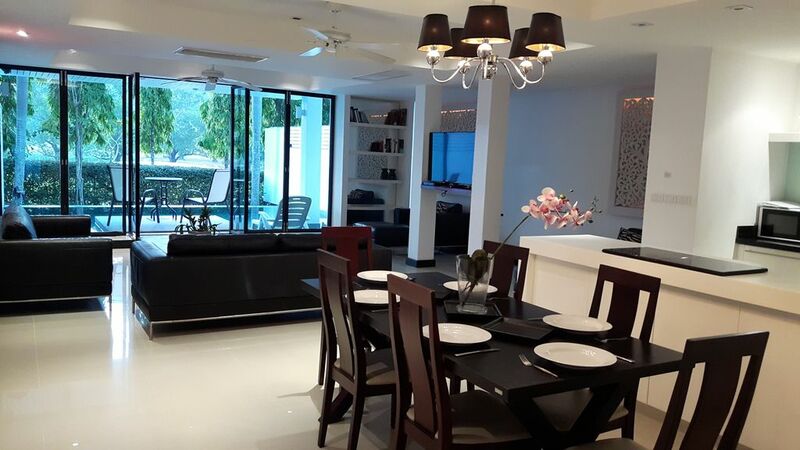 Large 4 bedroom villa on the Phuket Country Club golf course, in a private gated development. Sleeps 10 persons. All rooms have unobstructed golf course and mountain views with total privacy. Private Pool (6mx6m) is screened off from the golf course by plants and trees. Easy to supervise young children in the pool as it is just outside the lounge. Large master suite with king & double bed, balcony, en-suite bathroom with deep bath, separate glass rain shower cubicle & twin basins. Bedroom 2 has single bunk beds & balcony with rain forest view. Bedrooms 3 & 4 occupy the top floor, double beds, ensuite shower & stunning views. Extra inflatable bed and baby cot available. Free wifi & private parking. You could not be in a better location to enjoy all that Phuket has to offer. Peace & quiet guaranteed but only minutes from restaurants, cafes & bars, luxury spa for massage & beauty treatments. 5 mins drive to 2 more golf clubs - Loch Palm & Red Mountain. 5kms from Phuket town; museums, restaurants, bars, shopping, night life & temples. 5-10 mins from Bangkok Phuket hospital and Phuket International hospital. Phuket's biggest indoor shopping mall and multiplex cinema, Central Festival & bowling alley, super markets. Gymnasium with lap pool (day rate available). Phuket Town Night Market for shopping bargains. Kathu Waterfalls, Palazzo spectacular theatre & dinner show, famous Aphrodite Cabaret & Simon Cabaret. For kids & adults 4 mins drive to: Cable Water Ski, Kathu Go-kart tracks (2 tracks available), paintball, Flying Hanuman zipline & absail eco-adventure, Shooting range, Elephant trekking, Tiger Kingdom, Siam Niramit Show, monkey show, snake show, football golf park, Crocodile Park, Phuket Bird show, Butterfly Park. 10 minutes to Phuket's two main marinas, The Boat Lagoon and The Royal Phuket Marina. 15-20 mins to Kata, Karon, Kamala & Surin Beaches. Bang Wad Reservoir only 10 minutes walk away, one of the most beautiful spots in Phuket. Popular for walking, jogging and cycling with both tourists and locals (a circuit of about 6km around the lake) and is perfect for picnics. In the early evening there are stalls selling snacks and drinks. We are a family of 4 who moved to Phuket in 2014. We live on the development and look forward to welcoming you and helping you to enjoy the best that Phuket has to offer. PRIVATE SPEEDBOAT. Full day tour to Phi Phi including: 1. Visit at least 5 other islands. 2. Life jackets. 3. Snorkeling with mask & fins. 4. Free soft drinks. 5. Free lunch (to value of 200 baht). 6. FREE transfer to and from the boat. Kayak also possible. 3000 baht per person. Discount for group of 10 persons or more. Cheaper than public boat. With cold filtered drinking water. Usual crockery and cutlery for 8 settings. Luxury spa just a few minutes drive away. We had a comfortable stay at the villa and felt very much at home. The housekeeper and cleaner are superb. The owner was very helpful in meeting all our needs (We had 2 under 3's). It's a great retreat and would definitely play a few rounds of golf next time when the kids are more independent. You will need a car to get around though, it is not Patong Beach after all and thank goodness for that! ... all is perfect, quiet and clean. Thanks to Mum. The right place to explore the whole island. We arrived to be greeted with drinks which helped us relax immediately. The villa was even better than the photos. Loads of space and completely private and very peaceful but with fantastic views. All the rooms were beautifully decorated. We had a very relaxing holiday even though we don't play golf and were not far away from the beaches and shops! Just back from 3 glorious weeks at The Groves villas on the Phuket Country club. Hubby and I went – he is a golfer and I am not. He went off and chased the ball and I had the pool and villa to myself! Villa is fantastic - it’s a large 3 bed villa and it was perfect. -master bedroom and bathroom are to die for, and it was really handy having a little office with Wi-Fi, lovely finishes with an open plan kitchen that has all the equipment you would need. You can’t fault the guys that run this place – they even had a couple of beers in the fridge after our journey from Abu Dhabi. We were on our own for the first 2 weeks and the villa offered us everything we could want, we had 2 lots of friends join us for the last week and there was plenty of room. The location is good but would advise a car. The town of Kathu does not have much in it but the Groves folks put us onto the best local restaurant (Big chicken) not sure what its really called but food is fantastic – even had take out a couple of nights. Being in the middle of the island it’s a great place to explore everything. Would recommend a car though or you will miss it. Vince - who manages the property is a real character and an amazing resource for where to go and what to do. Villa is close to Patong (10 mins by car) but far enough away from the madness if it’s not your thing (not ours really but interesting for one night). Phuket is much nicer, some fantastic restaurants (Again Vince will sort you out) you must go to China Inn for lunch and there is a lovely shop there with original Burmese antiques. Some of the items in the villa re from there and are lovely and you are buying authentic products. We have tended to go the villa route in recent years mostly for the extra space and privacy they provide and the Groves was no exception, that coupled with the owners willingness to make our trip memorable is well worth recommending it to our friends. Oh and the golf – villa owners will get you discounts, just don’t know if it will help your game! All in all I would totally recommend The Groves, if you are not a golfer don’t be put off it’s a fantastic trendy Thai villa in a brilliant location. Our peaceful golf course location guarantees total privacy yet all the best activities you want from Phuket are less than 10 min away - beaches, shopping, eating & drinking, cinema, Elephant trekking, yachting, shows, golf courses & driving ranges, hospitals all within a short walk or taxi ride. Many restaurants & bars are only a 10 min walk. 10 minutes to Phuket's two main marinas, The Boat Lagoon and The Royal Phuket Marina. 30 mins to International Airport. Tesco, Makro and Big C superstores. Bang Wad Reservoir only 10 minutes walk away, is one of the most beatiful spots in Phuket. Very popular for walking and cycling with both tourists and locals (a circuit of about 6km around the lake) and is perfect for picnics. In the early evening there are stalls selling snacks and drinks. Golf: Phuket country golf club established in 1989, is the first and one of the finest golf courses built in Phuket, over a reclaimed tin mine site. The stunning beauty and elegance of the course, together with the typical Thai charm and hospitality will make your holiday here a joyful & memorable occasion. Awarded ' Best Courses in Thailand ' - Asian Golf Magazine 2001 Awarded ' Best Holes Par-Five ' - Asian Golf Magazine 2001.